the extremely tiny tyrannosaurus is in the giant glass bowl. 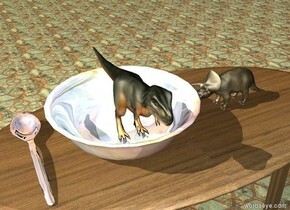 the extremely tiny triceratops is to the right of the bowl. it is on the table. it is facing the tyrannosaurus. the bowl is on the table. the table has a wood texture. the ground has a tile texture. the huge silver spoon is next to the bowl. The silver dove is 12 feet off the ground. 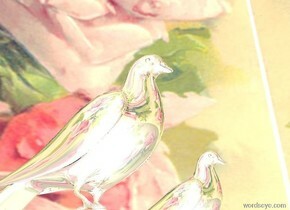 The second silver dove is 12 inches from the silver dove. The sky is a painting. The ground is shiny grey. the 1 foot tall cat is on the large sneaker. there are 12 small paisley cats behind the sneaker . 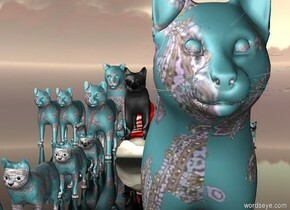 there are 12 small paisley cats to the left of the sneaker. there are 12 small paisley cats to the right of the sneakers. the ground is transparent. 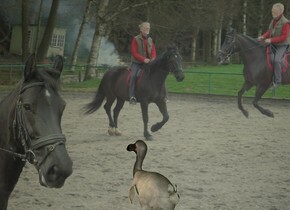 Pets and Musicans of Bremen. A dog on the donkey. A cat on the dog. A chicken on the cat. They are next to the farm house.This farm house is red. 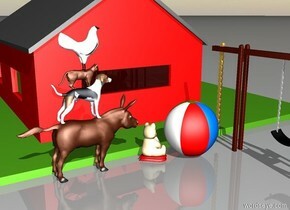 3 toys next to the farm house. 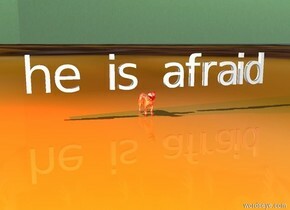 "he is afraid" is above the reflective red cat. The ground is [tile]. the sky is [fire]. there is a red light above the cat. The floor is parquet. The fireplace is on the floor. The wide brick wall is behind the fireplace. The photo is on the fireplace. 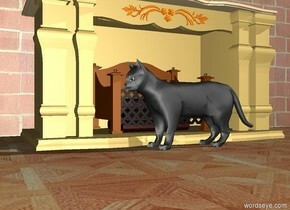 The cat is in front of the fireplace . The cat is facing to the left. It is morning. We all love our pet. 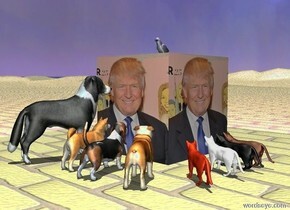 [trump]cube.a akita inu is 1 feet in front of the cube.the cube is 4 feet tall.the akita inu is facing the cube.a basset hound is right of the akita inu.the basset hound is facing the cube.a border collie is left of the akita inu.the border collie is facing the cube.a bulldog is right of the basset hound.the bulldog is facing the cube.a cat is 1 feet right of the cube.the cat is facing the cube.a house cat is in front of the cat.the house cat is facing the cube.the house cat is black.a white cat is in front of the house cat.the white cat is facing the cube.the sun's altitude is 90 degrees.a rust cat is in front of the white cat.the rust cat is facing the cube.the ground is brick.a parrot is on the cube.a violet light is above the parrot. Who's a clever little boy cedric. 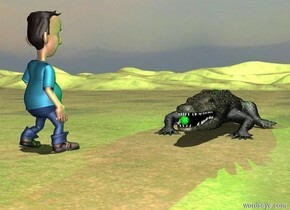 a crocodile.a ball is in front of the crocodile.the ball is 10 inches above the ground.the ball is -3 inches in front of the crocodile.the ball is 4 inches tall.the man is left of the crocodile.the man is 1 feet in front of the crocodile.the man is facing the crocodile.the sun's altitude is 95 degrees.a green light is above the crocodile.the ground is grass. a cube. the cube is 120 feet tall. the cube is green. a man. the man is 6 feet tall. the man is green. the man is 120 feet inside the cube. a sphere. the sphere is 1 feet tall. the sphere is 114.8 feet inside the cube. the sphere is green. 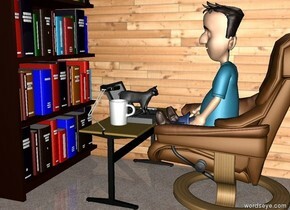 a succulent plant is -1.4 feet to the left of the man. the plant is 5 feet tall. 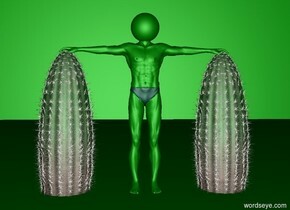 a succulent plant is -1.4 feet to the right of the man. the plant is 5 feet tall. The gold brain is -0.6 foot above the gold jellyfish. The shiny pink brain is -0.6 foot above the shiny pink jellyfish. The shiny turquoise brain is -0.6 foot above the shiny turquoise jellyfish. The gold jellyfish is 1 foot in front of the first alien. 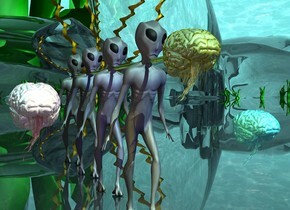 The turquoise jellyfish is 1 foot right of the first alien. It is in front of the first alien. The pink jellyfish is 1 foot left of the first alien. It is in front of the first alien. The gold jellyfish is 2.3 foot above the ground. The turquoise jellyfish is 1 foot above the ground. The pink jellyfish is 1.5 foot above the ground. The gold jellyfish faces west. The pink jellyfish faces west. The turquoise jellyfish faces west. The sun's azimuth is 170 degrees. The camera light is black. The sky has the water texture. The water texture is 500 feet tall. The ground is clear. The sun is 75% turquoise. The second alien is 1 foot behind the first alien. The third alien is 1 foot behind the second alien. The fourth alien is 1 foot behind the third alien. The clear yellow cylinder is 7.5 feet tall. It is 1 inches wide. It is 1 inches deep. It faces up. It is behind the gold brain. It is -0.4 feet above the gold brain. The dim pink light is in front of the pink brain. The dim yellow light is in front of the gold brain. the dim blue light is in front of the turquoise brain. There is a penguin. 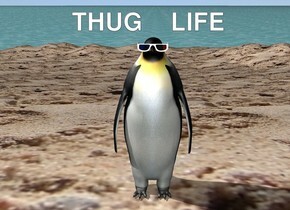 Headwear is 5 centimeters in the penguin. headwear is 0.001 centimeters in front. the penguin is on an island. the island is sand. the ground is water. there is a 2 feet behind and 2 feet to the left of the penguin. The dull fire tube is 43 feet wide. It is 57 feet deep. It is 19 feet tall. The ground is silver. Death is 32 feet tall. Death is -3 foot behind the tube. Death has the [cloth] texture. The texture is 7 feet tall. Death is dull. 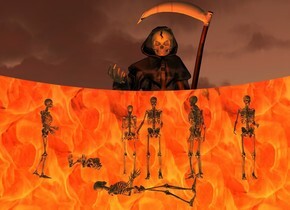 Death leans 12 degrees to the front. The sun is cocoa. The camera light is black. The first skeleton is 6 feet tall. It is -9 feet above the tube. It is -20 feet behind the tube. The rust light is 6 foot in front of the first skeleton. It is 12 feet below the first skeleton. The dim yellow light is 13 foot in front of the first skeleton. It is 12 feet below the first skeleton. The second skeleton faces northwest. It is 1 foot right of the first skeleton. It is 6 feet tall. The third skeleton is left of the first skeleton. It is 2 feet behind the first skeleton. It is 6 feet tall. it faces north. The fourth skeleton faces up. It is 3 feet left of the first skeleton. It is 6 feet tall. The fifth skeleton is 2 feet behind the second skeleton. It faces southwest. It is six feet tall. The sixth skeleton is 1 foot left of the fourth skeleton. It faces east. It is six feet tall. The seventh skeleton is 1 feet right of the second skeleton. It faces south. The eighth skeleton leans 90 degrees to the back. It faces east. It is 3 feet in front of the first skeleton. It is -1 foot below the first skeleton. The dim red light is behind the first skeleton. It is 12 feet below the first skeleton. The dim orange light is left of the first skeleton. It is 12 feet below the first skeleton. The dim apricot light is right of the first skeleton. It is 12 feet below the first skeleton. The red orange light is in front of Death. It is -10 feet above Death. There is a large yellow squirrel. A large blue turtle is next to the yellow squirrel.the ground is [texture]. the ground is unreflective. the rhino is 4 feet above the ground. the enormous stone crab is 2 feet in the rhino. it is -8.5 feet in front of the rhino. the rhino is 3 feet tall. 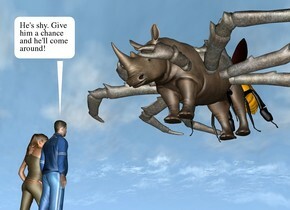 the very humongous bee is -2.5 feet behind the rhino. the small man is 1 foot in front of the rhino. he is facing the rhino. he is on the ground. the small woman is left of the man. she is facing the rhino. the ground is grass. There is a HUGE HUGE HUGE rat on the sidewalk. 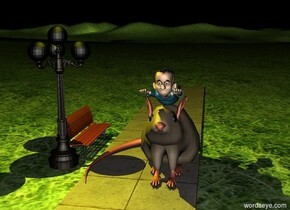 There is a small man on the rat. There is a small lamp post 0.01 feet to the left of the sidewalk. There is a small bench behind the lamp post. the bench faces east. It is night. There is a large yellow light on the lamp post. There is a small tree .01 feet to the right of the rat. There is a tree. The ground is grass. There is a large cat. 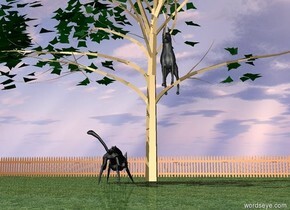 The cat is facing the tree. The cat is 8 feet in front of the tree. There is a big dog 4 feet in the tree. 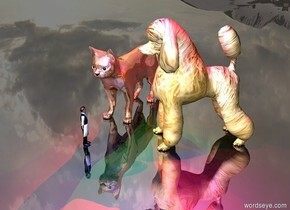 The dog is 2 inches to the right. There is an extremely long fence 30 feet behind the tree. There is an extremely long fence to the left of the fence. the red man is facing backwards. the tiny palm tree is 10 feet in front of and to the left of the man. the small camel is to the right of the tree. it is facing backwards. it is leaning 30 degrees to the right. the huge shiny yellow sphere is 2 feet above and to the right of the man. the yellow light is in front of the sphere. 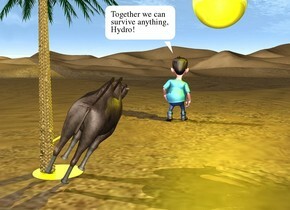 the shiny yellow tube is -9 inches to the left of the camel. it is 1.7 feet tall. it is 1 inch wide. it is leaning 60 degrees to the left. it is 11 inches above the ground. the shiny yellow circle is under the tube. it is on the ground. a dodo. 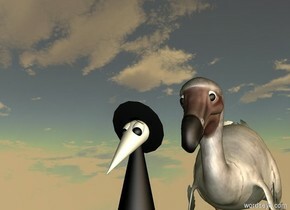 behind the dodo is a small [black] wall.the dodo is facing northwest.the wall is 90 inch tall and 120 inch wide.it is dusk.the camera light is gray. Ground is wooden and unreflective. The wall is white. The giraffe is 12 feet in the ground. it is 1 foot in front of the wall. the giraffe is facing the wall. a big mirror is in front of the wall. it is 1 foot above the ground. There is a huge wood floor on the wall. there is a second wall left of the wall. the second wall is facing left. it is very long. the big head is to the right of the mirror. it is 4 feet above the ground. it is 1 foot away from the mirror. the couch is to the left of the mirror. it is on the ground. it is 2 feet in front of the mirror. the end table is below the head. it is in front of the head. it is on the ground. 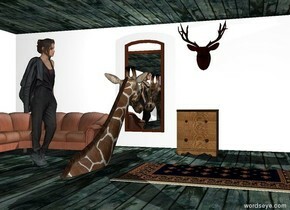 the rug is to the right of the giraffe. it is -1 inches above the ground. the white light is .5 foot above the giraffe. it is behind the giraffe. the woman is next to the giraffe. she is on the ground. she is facing the giraffe.